Students in the English class (Photo: VNA). The class is remarkable in that students learn English for fun, rather than for an examination, meanwhile, their parents are not having to spend money. The Happy Class, launched in July 2017, aims to offer an English practicing playground for kids whose parents are unable to afford expensive English courses. 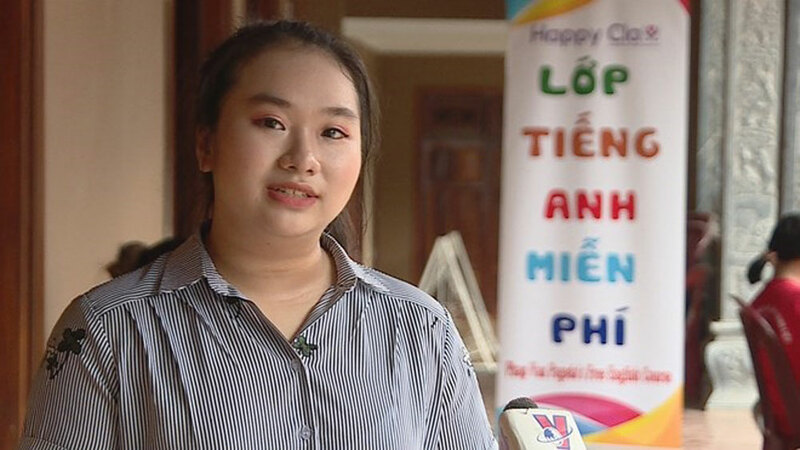 “Many children don’t have much money to study in the various English centres around the city, so we decided to set up Happy Class to share our passion for the English language with everyone,” Nguyen Minh Anh, co-founder of Happy Class told. 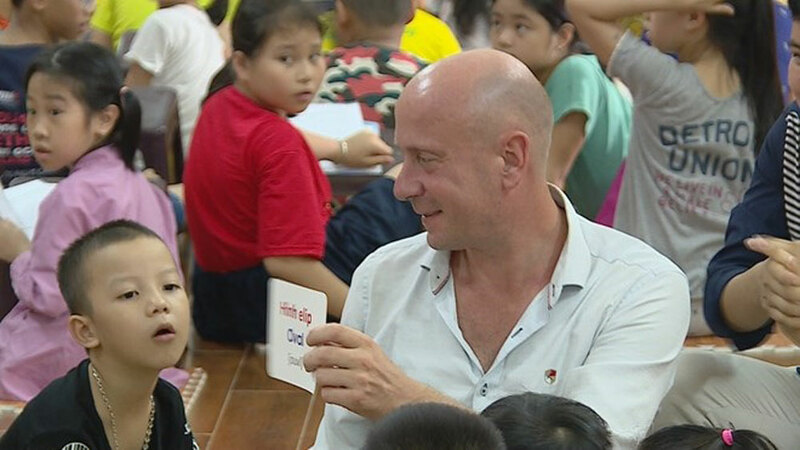 “We connect with English centres in Hanoi to look for foreign teachers who are willing to teach for free in our classes so that our students have the chance to talk with native speakers,” Minh Anh said. Victor Anthony Skulicz is teaching English to children (Photo: VNA). Happy Class offers a friendly and comfortable learning environment for kids so that they can learn English while still enjoying their weekend. “The kids don’t have to worry about examinations or grades in our class. 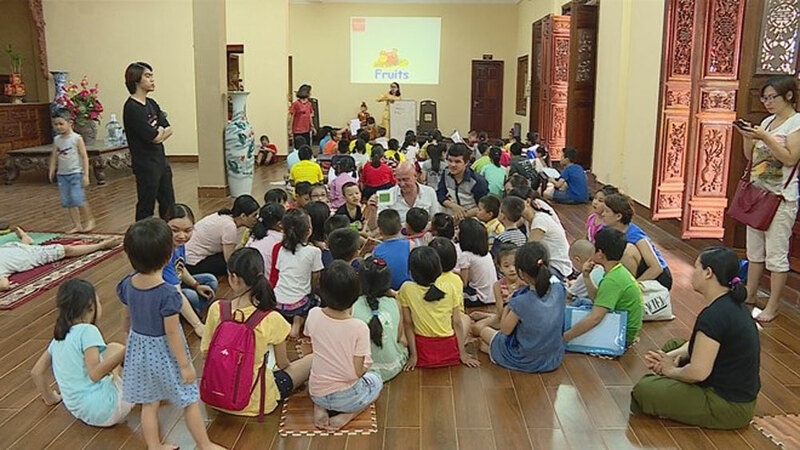 That way, they will learn English more freely and naturally,” said Tran Thi Huong Duyen, founder and main teacher of Happy Class. Victor Anthony Skulicz, from the UK, has offered his voluntary teaching at Happy Class for six months now. He believes a friendly and comfortable learning environment is crucial for kids to learn the language, saying that young kids have more relaxing minds with which to absorb information like a sponge. The teachers look to introduce a comfortable surrounding rather than a formal one, so students don’t feel afraid or shy. During summertime, the class serves up to 150 students of different ages. The class also has a team of 15 volunteers to help teachers organize activities, set up tools, and take care of the kids. Nguyen Duy Khang learned about the class when visiting the pagoda. He has volunteered for the class for six months. The number of students is increasing, therefore there is a lot of work for volunteers to do, such as printing materials, setting up activities, and dividing groups. “Sometimes, we serve as interpreters for the foreign teachers because not all students can understand instructions in English,” Khang said. At first, the class aims to provoke interest in the language among kids. However, many have also developed their English proficiency. “I have come across five or six students in the class who have really developed over a short period of time,” Victor said. Nguyen Minh Anh, co-founder of Happy Class (Photo: VNA). The native English teacher believes the outstanding students are those who believe in their confidence and put a lot of practice in outside of the class. Parents taking their kids to Happy Class now also have the chance to learn English for free at the pagoda. The class for adults aims to fill in the parents’ waiting time while giving them English skills so they can help their children. Founders hope that more teachers, particularly foreigners, will offer their voluntary teaching so that more students will have the opportunity to learn English, as they never know when they will need English.